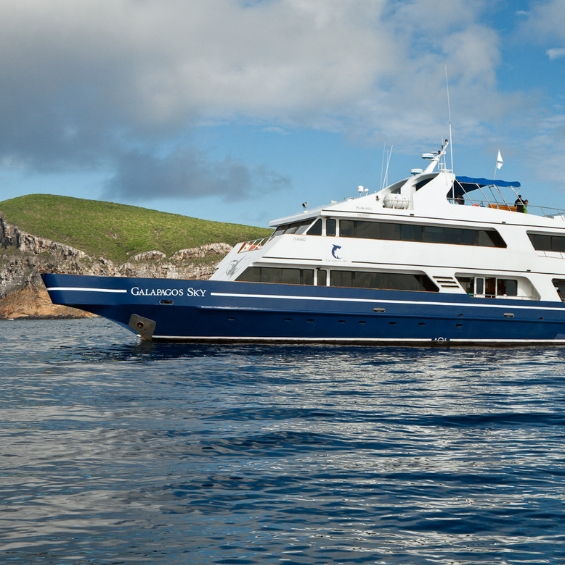 This north west Galápagos journey boasts features of the ideal island getaway: cool breezes, colorful sands and crystal-clear waters that are a veritable snorkeller’s paradise. Yet these isles were also the inspiration for Darwin’s Theory of Evolution. 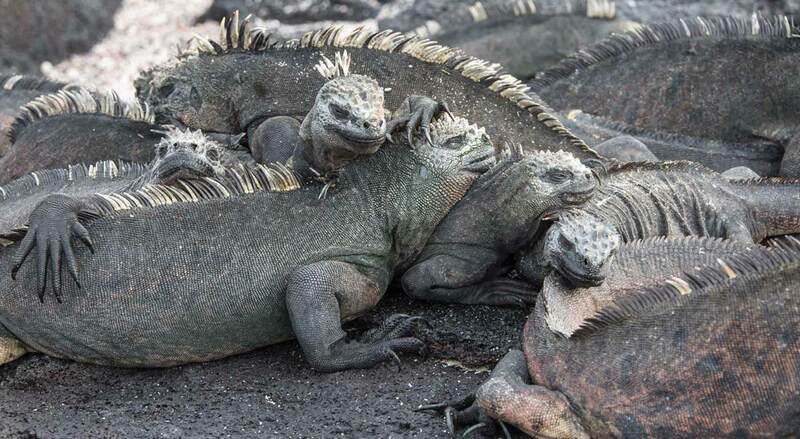 Get thrillingly close to unique wildlife species here, including Blue- and Red-Footed boobies, Marine iguanas, Giant tortoises and more. The ideal island getaway: cool breezes, colorful sands and crystal-clear waters that are a veritable snorkeller’s paradise. Yet these isles were also the inspiration for Darwin’s Theory of Evolution. 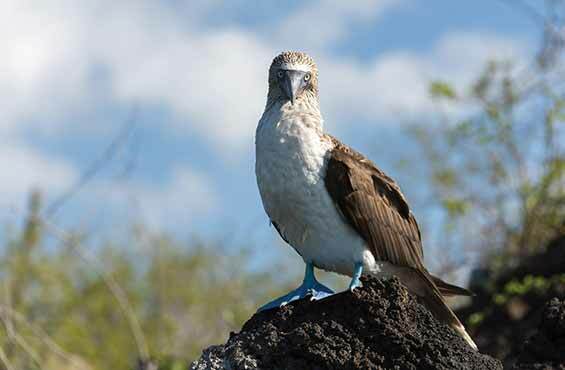 Get thrillingly close to unique wildlife species here, including Blue- and Red-Footed boobies, Marine iguanas, Giant tortoises and more. Baltra Island, also known as South Seymour, is the gateway through which most people enter and depart the Galápagos Islands. Upon arrival and once through immigration procedures, visitors are transferred directly to a nearby dock to join the ship by zodiac. The runway was first constructed here during World War II when the island was used as a US Army Air Base. 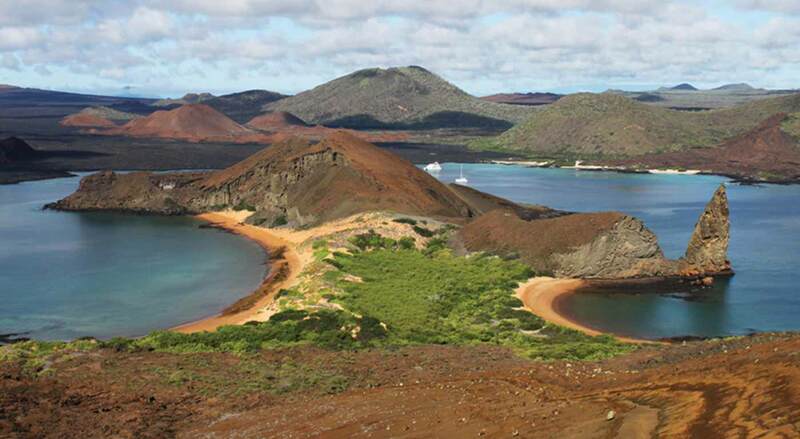 Located near the geographic center of the Galápagos, the island itself is small, flat and arid. 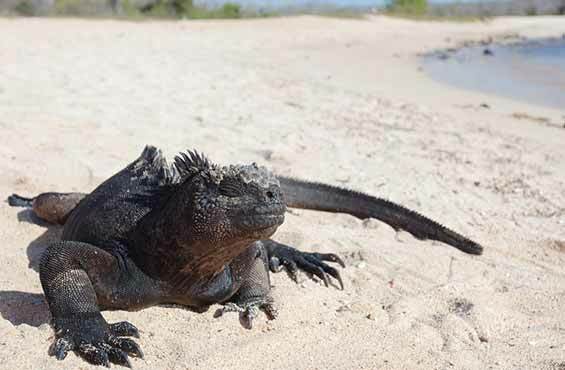 Its dry environment hosts Salt bushes, Prickly Pear cactus and Palo Santo trees, all of which support land iguanas that can occasionally be seen crossing the runway. At Genovesa Island the ship tucks into Darwin Bay, an ancient volcanic crater now flooded by the sea. 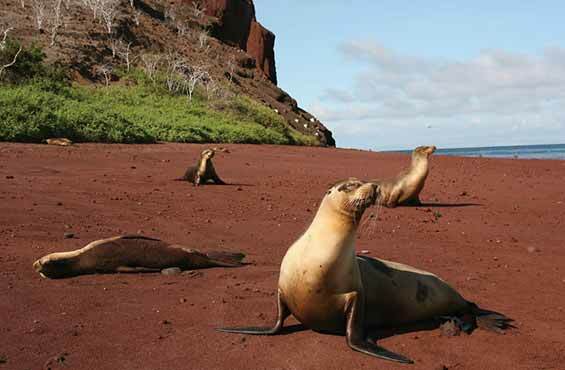 Zodiacs land on a picturesque sandy beach where Galápagos sea lions often rest on the fine, white sand. 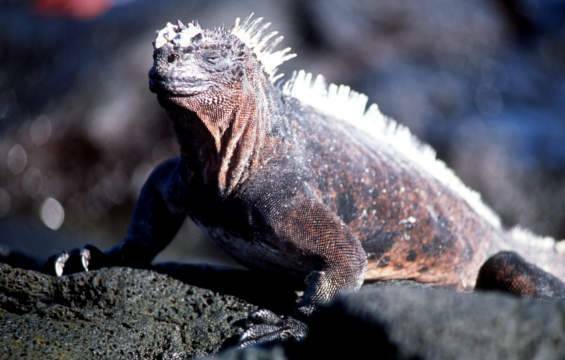 Explorations along the shore may reveal marine iguanas looking like prehistoric dinosaurs in miniature. By heading inland over a short distance, visitors could encounter seabirds of all shapes and sizes nesting in the vegetation. Scores of immature Red-Footed boobies perch on branches within an arm’s reach of the path. 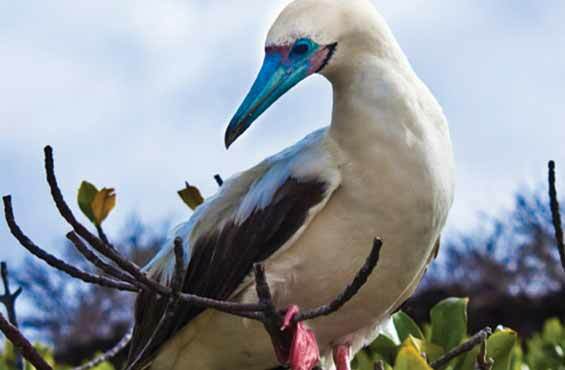 In addition, watch for Great Frigatebirds and Yellow-Crowned Night herons along the walk. Rabida Island has received accolades for being one of the most exotic spots on earth and while it is small in size, the island is dramatic in scale. Rugged red cliffs rise from the sea and zodiacs land onto a beach of dark red sand colored by iron ore. Ghost crabs and Galápagos sea lion pups often rest on the russet sands. Further inland, the rusty sand gives way to shrubby coastal vegetation dominated by Prickly-Pear cactus. Common Cactus finches feed on the yellow flowers while Darwin finches and Lava lizards skitter across the path in search of food. 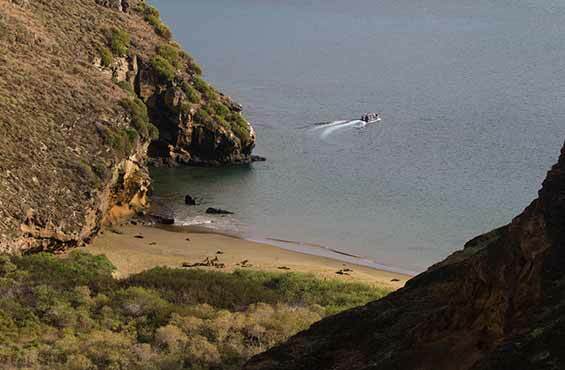 Just off Santa Cruz, Eden Islet offers up a thick coastal mangrove forest growing on black volcanic boulders peppered with tall Prickly Pear cactus. Eden is a small, eroded tuff cone from an ancient volcano, and is an excellent example of the unique geology of the Galápagos. The shallow waters around the island are ideal for spotting Pacific Green sea turtles, Reef sharks, Eagle rays, sea lions, Marine iguanas and Sally Lightfoot crabs. Explore by zodiac or kayak, and watch for Brown pelicans flying and diving to scoop up their prey, while Blue-Footed boobies enter the water like torpedoes to spear small fish. 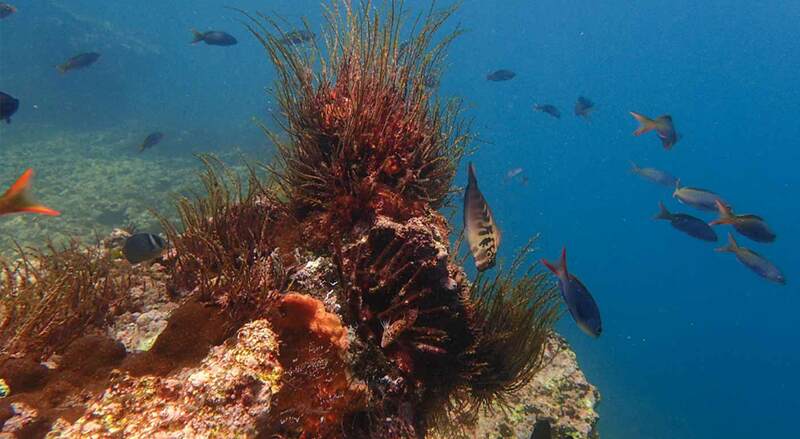 On the northern shore of San Cristobal Island is a peninsula known as Punta Pitt. The point is made up of two coalesced volcanoes and is much younger than the rest of the island. Some of the lava flows are only a few centuries old. A zodiac landing on a sandy beach will lead to a long walk following a twisting red gravel path that runs through black basalt lava rocks, and between craggy peaks. The vegetation along the way is low and scrubby, and attractive blue-gray lichen grows on the rocks. Gaining elevation along the narrow trail will open up views of the Silver Galapagos sitting in a sapphire blue sea far below. Isla Champion is a small islet off the Floreana Island’s northeast coast. 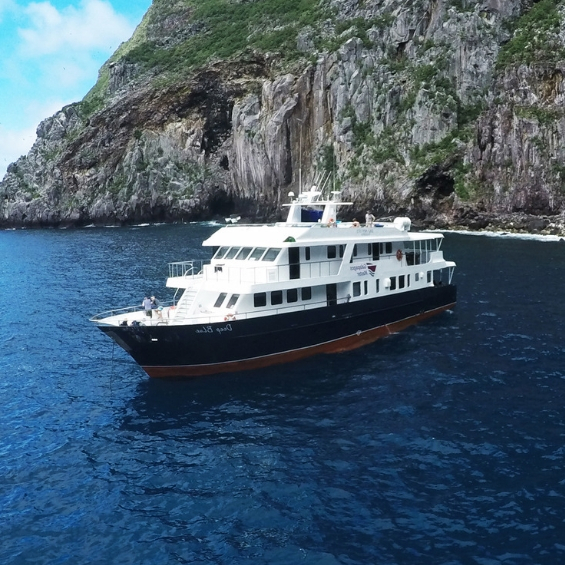 To cruise by it reveals a bare, rocky island without much allure, but to enter the infinitely blue waters around this small landmass is to discover a spectacular underwater realm. 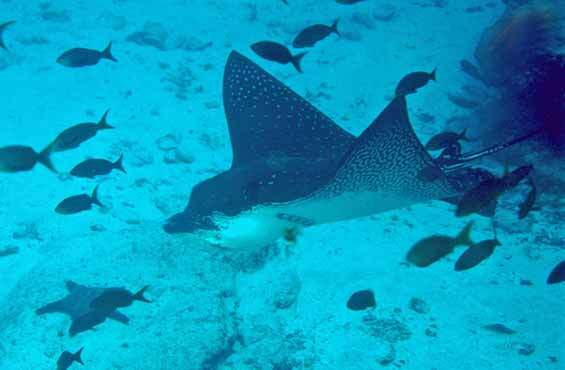 The visibility is generally impressive and thanks to this water clarity snorkellers often spot Reef sharks patrolling the reef wall, cruising Pacific Green turtles, and playful Galápagos sea lions. Encounters in the blue ocean with thousands of small Silver minnows, large tuna fish, or Oceanic sunfish are not unheard of either. Silver Galapagos will anchor in front of Puerto Ayora, Santa Cruz, where the prestigious Charles Darwin Research Station is located. 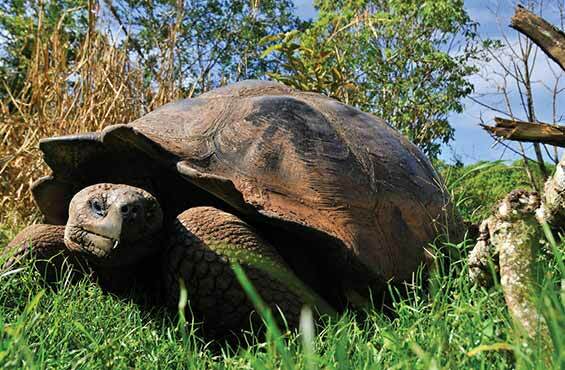 The station also houses the Fausto Llerena Breeding Center for giant tortoises and land iguanas where guides interpret the center’s captive breeding and reintroduction programs. 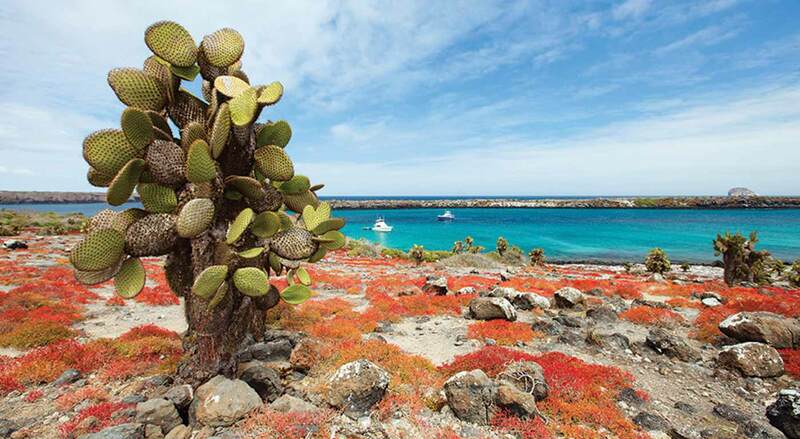 In addition to these star species, throughout the station there are huge Prickly Pear cactus trees being fed upon by the pretty Galápagos Cactus finch. To round out the stay in Puerto Ayora, enjoy free time in town where local artists have created charming art galleries and corner cafés.